The COPD Foundation Guide to COPD Diagnosis and Treatment is designed to provide practical advice for the health care provider. Available as a hard copy, online and as a mobile device application (app), the Guide serves as an accessible tool for clinicians. To date, over 400,000 cards have been distributed to health care providers nationwide at no charge. The Guide is updated as necessary and suggestions from the COPD physician and health care provider community are integrated into updates. Guidelines have evolved into large, evidence-based, textbook-like documents and are hence becoming less practical for the pragmatic physician. Little effort during guideline development is spent considering dissemination or implementation. The Guide’s staging of spirometry was designed to be comprehensive. Five spirometry grades are described to ensure that all individuals fit into a group. The fact that many individuals are unclassified by other systems, but may have problems, has been an impediment for many clinicians . 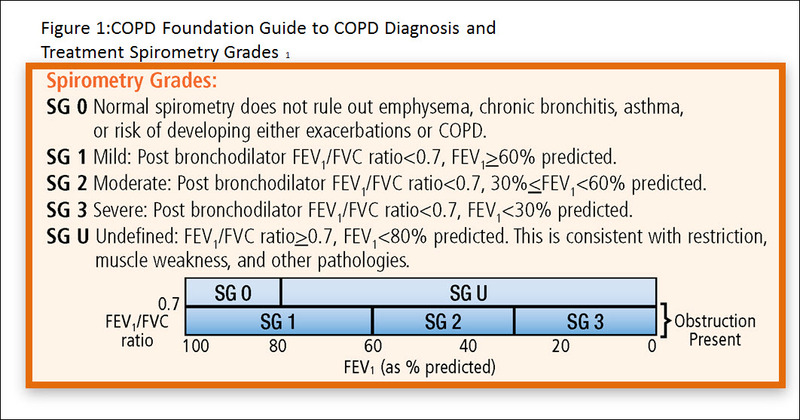 Spirometry grade 0 (SG-0) includes normal individuals as well as individuals who may have disease but whose measured values remain within the normal population boundary. SG-0 does not exclude the presence of emphysema, chronic bronchitis or the risk of developing exacerbations. Further, individuals within SG-0 may have symptoms requiring treatment. The previously mentioned consensus statement stressed the importance of an FEV1 of 60% in determining those who might benefit from regular maintenance therapy. 7 The Guide has adjusted the spirometry grades to reflect this cut-off for those with significant COPD where management should be based on patient performance as well as symptoms.1 Spirometric severity <30% is a reasonable guide to initiate management plans for those with severe disease, although spirometry is but one measure of COPD severity. 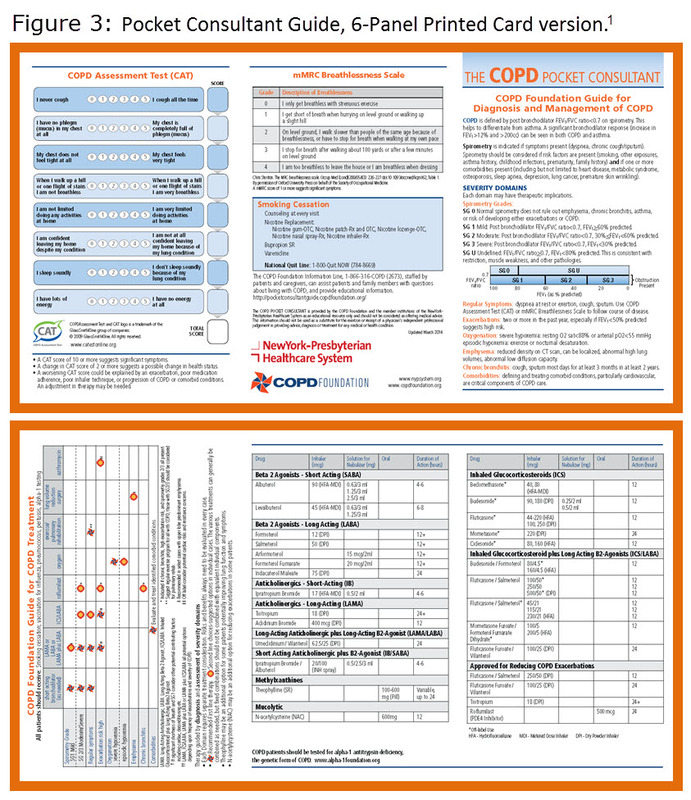 To address the heterogeneous clinical problems that beset COPD patients, the 2013 revision of the Guide suggested an approach based upon 7 severity domains: spirometry, symptoms, exacerbations, oxygenation, the presence of emphysema, the presence of chronic bronchitis, and comorbidities.1 A Therapy Chart listing the 7 severity domains in rows and recommended therapy options in columns is a new feature. This approach can guide clinicians to make decisions appropriate for the heterogeneous problems faced by COPD patients in a systematic and easily implemented fashion. In addition, the Foundation has launched a free i-Phone app that allows the Guide to be used in a more interactive format. The first edition of the app lists available generic medications. Subsequent editions will allow the user to toggle between brand name and generic name drugs. An edition featuring European medications is also being developed. The app can be found in the Apple App Store by searching COPD Foundation. An Android app is under development as well and will be released in Summer 2014. The Guide is designed to be a practical and useful clinical tool. Future revisions that reflect changes in clinical knowledge and practice will take place at least once per calendar year. The most current revision was released March 2014. To facilitate the broadest possible base for improving the Guide going forward, the COPD Foundation has launched a social collaboration website, the Pocket Consultant Guide Online Community at pocketconsultantguide.copdfoundation.org.14 In addition to a download library and information about how to use the Guide, there is a community forum for health care professionals to discuss the Guide. Subsequent revisions to the Guide will be based on these conversations. 1. Rennard S, Thomashow B, Crapo J, et al. 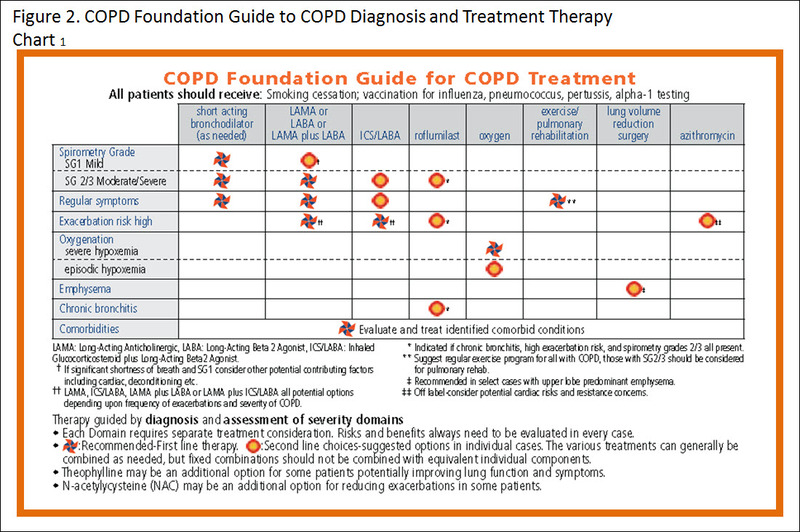 Introducing the COPD Foundation Guide for Diagnosis and Management of COPD, Recommendations of the COPD Foundation. COPD. 2013;10(3): 378-389. doi: http://dx.doi.org/10.3109/15412555.2013.801309. 2. European Respiratory Society. E-learning resources: Standards for the diagnosis and treatment of patients with COPD.ERS Web site http://www.ers-education.org/pages/default.aspx?id=2005. Published 2004. Accessed March 6, 2014. 3. Celli BR, MacNee W; and ATS/ERS Task Force. Standards for the diagnosis and treatment of patients with COPD: A summary of the ATS/ERS position paper. Eur Respir J 2004; 23(6):932-946. doi: http://dx.doi.org/10.1183/09031936.04.00014304. 4. National Clinical Guideline Centre. Chronic obstructive pulmonary disease: Management of chronic obstructive pulmonary disease in adults in primary and secondary care. National Clinical Guideline Centre Web site. http://www.nice.org.uk/nicemedia/live/13029/49425/49425.pdf. Published 2004. Updated 2010. Accessed March 6, 2014. 5. Global Initiative for chronic Obstructive Pulmonary Disease (GOLD). Global Strategy for Diagnosis, Management and Prevention of COPD. GOLD Web site. http://www.goldcopd.org. Published 2013. Accessed March 6, 2014. 6. Vestbo J, Hurd SS, Agusti AG, et al. Global strategy for the diagnosis, management, and prevention of chronic obstructive pulmonary disease: GOLD executive summary. Am J Respir Crit Care Med. 2013;187(4):347–365. doi: http://dx.doi.org/10.1164/rccm.201204-0596PP. 7. Qaseem A, Wilt TJ, Weinberger SE, et al. Diagnosis and management of stable chronic obstructive pulmonary disease: A clinical practice guideline update from the American College of Physicians, American College of Chest Physicians, American Thoracic Society, and European Respiratory Society. Ann Intern Med. 2011;155(3):179–191. doi: http://dx.doi.org/10.7326/0003-4819-155-3-201108020-00008. 8. Holguin F, Folch E, Redd SC, Mannino DM. Comorbidity and mortality in COPD-related hospitalizations in the united states,1979 to 2001. Chest. 2005;128 (4):2005–2011. doi: http://dx.doi.org/10.1378/chest.128.4.2005. 9. Barr RG, Celli BR, Mannino DM, et al. Comorbidities, patient knowledge, and disease management in a national sample of patients with COPD. Am J Med. 2009; 122:348–355. doi: http://dx.doi.org/10.1016/j.amjmed.2008.09.042. 10. Silverman EK, Sandhaus RA. Alpha1-antitrypsin deficiency. N Engl J Med. 2009; 360:2749–2757. doi: http://dx.doi.org/10.1056/NEJMcp0900449. 11. Wan ES, Hokanson JE, Murphy JR, et al. Clinical and radiographicpredictors of GOLD-unclassified smokers in the copdgene study. Am J Respir Crit Care Med. 2011;184(1):57–63. doi:http://dx.doi.org/10.1164/rccm.201101-0021OC. 12. Boulet LP, Becker A, Bowie D, et al. Dissemination and implementation of guidelines on asthma and COPD in Canada: Where do we go from here? Can Respir J 2006: 13(suppl A): 46A-47A. 13. COPD Foundation. COPD Foundation online inventory ordering Web site. http://copd.oiondemand.com. Published 2014. Accessed March 6, 2014. 14. COPD Foundation. COPD pocket consultant guide online community. 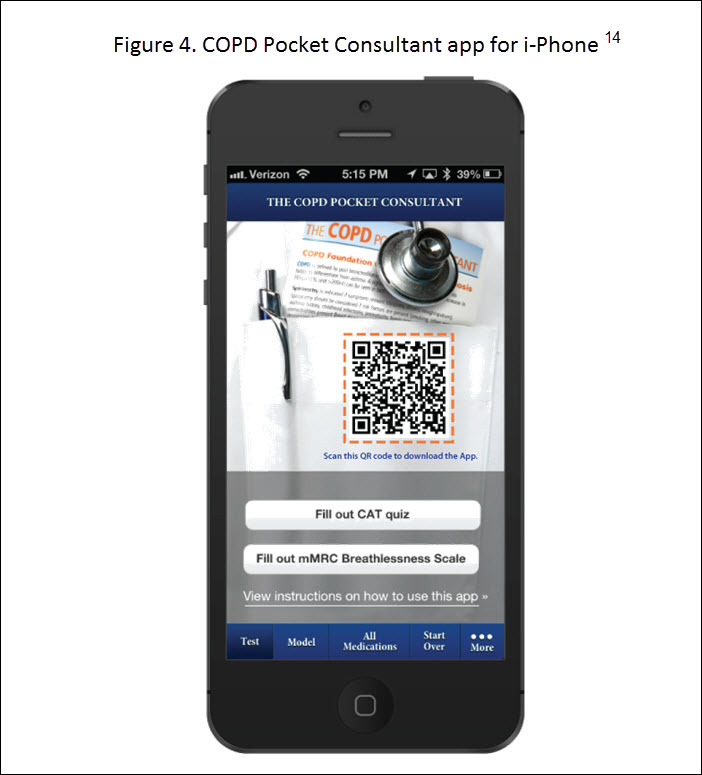 COPD Foundation pocket consultant guide Web site. http://pocketconsultantguide.copdfoundation.org Published 2014. Accessed March 6, 2014.